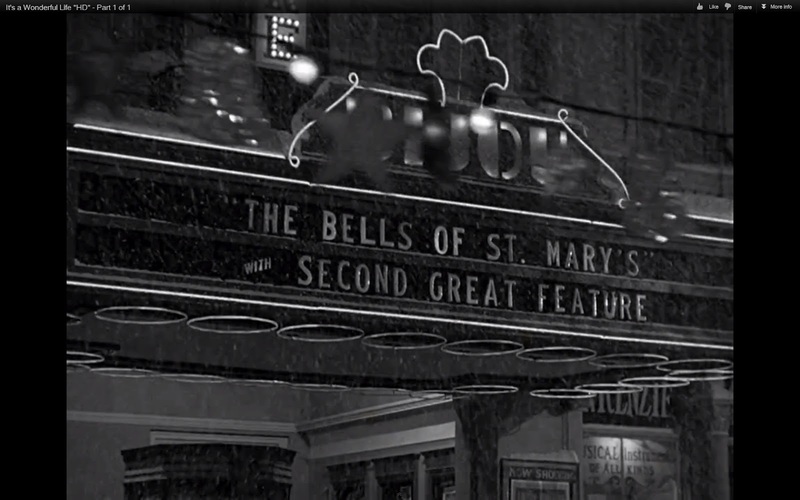 Writing about the movie house in Bedford Falls creates a lot of twists concerning movies within a movie, as there is a lot of things which relate to the Bijou theatre which are reflected in the creation and cast of It's a Wonderful life. 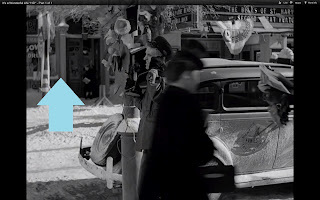 The movie house is most prominently presented in George's famous joyful run by it toward the end of the movie as he makes his way past Potter in the bank, past all the famous family sites, and eventually of course back to his family. Bijou Theatre along main street. This building is a tale of two, or really 3 buildings essentially as it changed over time through the course of the film. As far as we can see, the structure was known earlier as the Bijou theatre, and then at some point after George and Mary's wedding the owners built a classic movie theatre front to it. 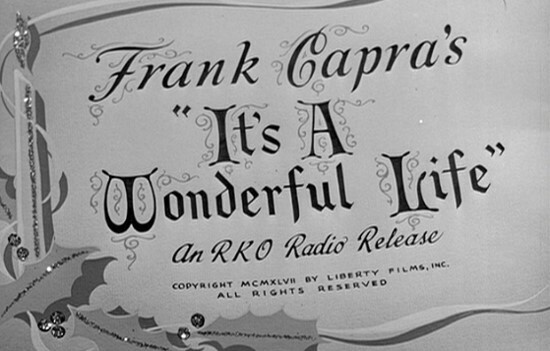 Seen below earlier in the film without the front we can compare the changes. 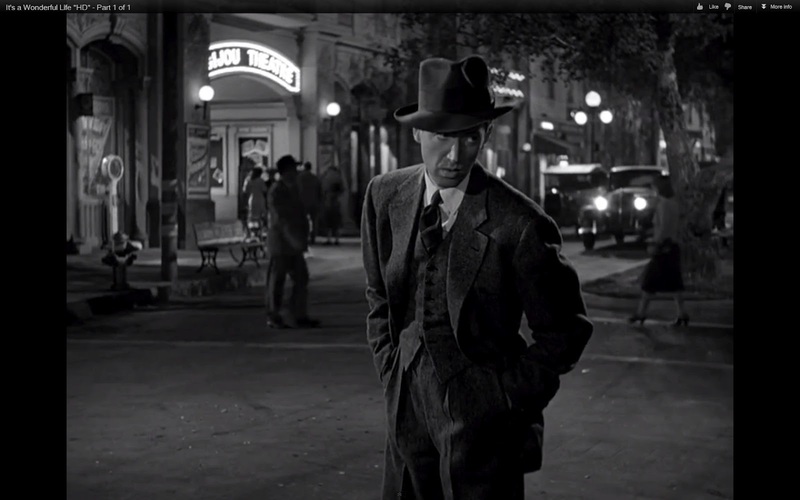 We get our best look at it as George is walking out some lonely frustration along main street before meeting Violet. 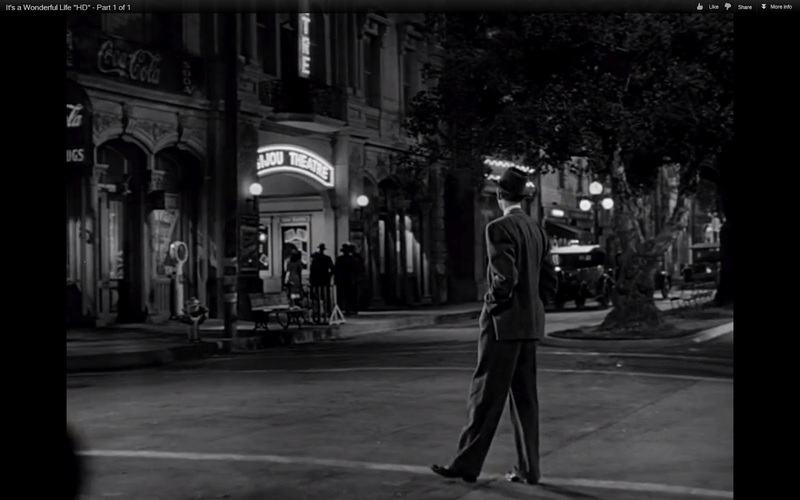 Notice how alive the town and theatre seems. 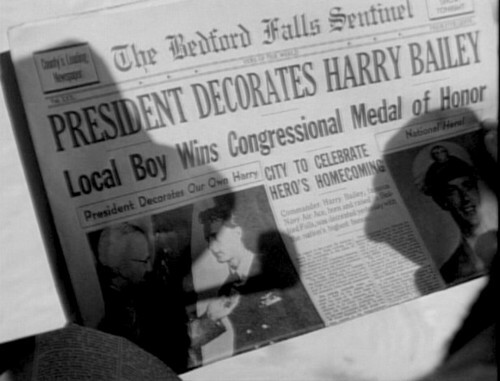 Capra really did a great job with the various cars and extras walking around in this scene to create a Bedford Falls we can believe in. Violet runs over away from her two bow tied interests who offer a creepy glimpse at just how Ms. Bick does manage to get by in town. 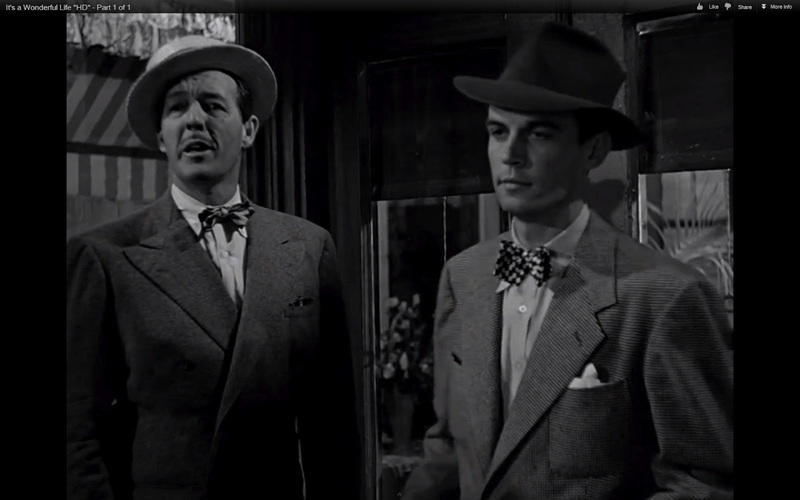 Losers trying to court Vi: Bow Tie brothers as I call them. Bailey in the 60's, is it the same guy? 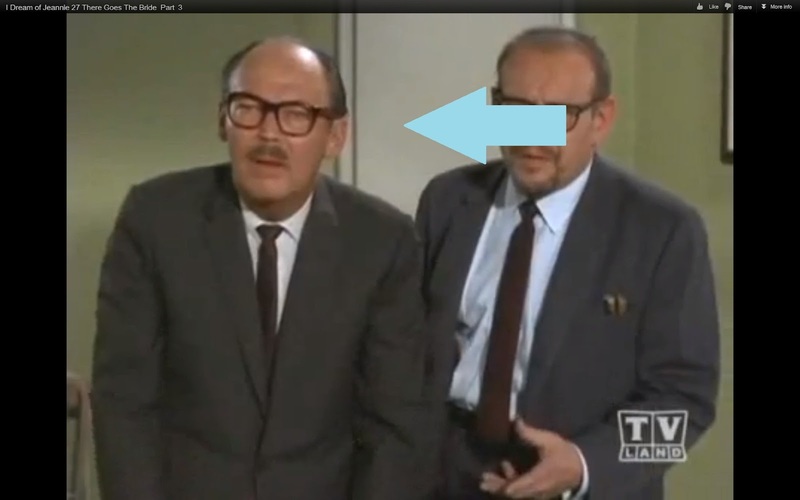 One of them, while only listed as an uncredited role, the actor on the left is named Jack Bailey. He can also be found cast in an episode of I Dream of Jeannie 20 years later. Or at least I'm pretty sure that's him. Listen to his voice as he calls after Violet and in the episode as I think the voice matches more than visual recognition can tell us. Bailey, best remembered for his role as host of the popular Queen for a Day show. had a lackluster career before passing away in 1980. Queen for a day intro seen here, is worth taking a look at for its nostalgic 1950's feel. 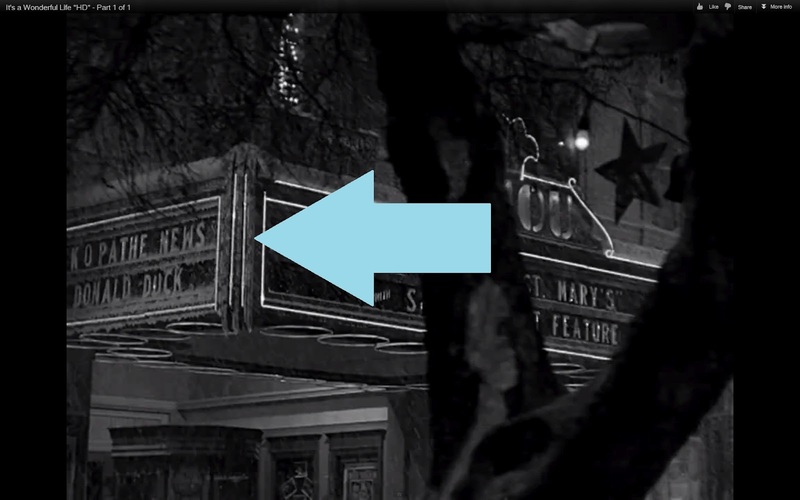 Drifting back to the structure, here is what the changes brought to the building as it came to be referred to by George as the "movie house". Earlier when speaking to Ernie, we see that the location sits right beside Mr. Gower's establishment. 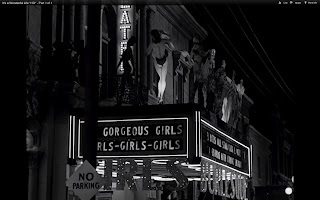 The front section was added to create a famous marquee signage which became popular in the 30's and 40's. The famous Chicago Theatre still holds its famous marquee and was completely restored to it's original look. A great vintage version can be seen during the footage of the Gone with the Wind premiere in 1939. 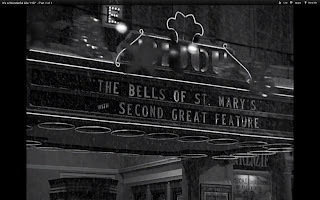 On our Bedford Falls marquee we find that in light of the CHRISTmas spirit, the movie showing on this important night is none other than the famous Bing Crosby picture "The Bells of Saint Mary's" along with an unnamed second feature. From what we can see along the side of the marquee the current show also features a cartoon Disney short with Donald Duck as well as some kind of newsreel from RKO Pathe News. You can find an example of just such a newsreel from late 1945 and quite likely the one that might be referred to here at this link. 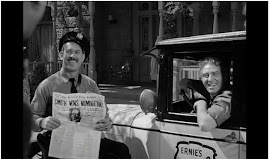 Donald's role on the other hand was featured in 7 films in 1945 so we don't know which one is being shown here but you can see most of those on You Tube if your curious. 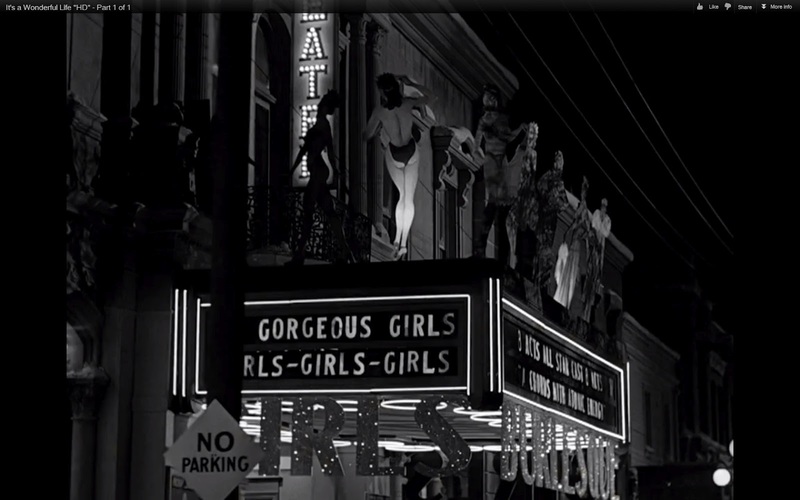 The third version of the Bijou theatre is the one that forms in the world without George (WoG on this blog) and Pottersville. As main street is turned into a collection of run down and dirty questionable business and gambling operations, the movie house of course was altered too. Apparently a cast of “gorgeous” girls “sings” as a choir of some sorts. Focusing in on the newly title marquee we can read the advertisement of this musical group. "8 ACTS ALL STAR CAST 8 ACTS"
"A CHORUS WITH ATOMIC ENERGY"
Atomic Energy huh? Quite the change from Father O'Malley. Just another reason we're glad George found his way back home. And onto the village piece and unboxing. The Enesco Bedford Falls Bijou movie house is from the second series of the collection. It's one of the better pieces, yet I find myself saying that a lot. There is however one major flaw, or perhaps the word should be defect as I think they really dropped the ball on the mold design. Enjoy the show! Enesco Bijou Theatre: Box front. Please click below at 'Read More' to continue with the photos. And now some shots in the light. The big thing you'll notice is the disappointing front marquee. It's small, is missing the vertical signage, isn't the right shape, and just overall lacking an impressiveness that betrays the entire point of the sign. Note along each picture. Enesco Bijou Theatre: Front face. Enesco Bijou Theatre: Side view. Like the snow hanging. Enesco Bijou Theatre: Rear view not that impressive but again the snow hangs is a nice touch. Enesco Bijou Theatre: Side view, notice at least some note of the news reel and cartoon. Enesco Bijou Theatre: If they took enough attention to add and notice this, how could they not put together a more impressive front? Enesco Bijou Theatre: Top down boring square. Enesco Bijou Theatre: Snow overhang. Enesco Bijou Theatre: Marquee sign. At least they got the right film. Enesco Bijou Theatre: Entry way. Seems like there are two doors for some reason. Enesco Bijou Theatre: Marquee angle. Sad they didn't use a bit more design changes to create a unique front. And onto the night lit up shots. It's here that the marquee of the theatre should literally shine, but instead it's missing anything remotely close to that though process. Judge for yourself. Enesco Bijou Theatre: Doors look good. Violet: "Why, it's ten miles up to Mt. Bedford!"